Tag line: "SINATRA... as a kill-hungry hoodlum! Trivia: This is the film that Lee Harvey Oswald supposedly watched just a few days before assassinating President John F. Kennedy. In the opening sequence of Suddenly, a traveler (Roy Engel) pulls his car up next to a police officer (Paul Wexler) and asks for directions. Before long, the conversation shifts to the name of the town they’re in, which the officer says is called “Suddenly”. It’s a strange name for a town, to be sure, one that we learn dates back to the gold rush, when things happened pretty quickly around these parts. Nowadays, it’s much quieter, and the officer jokes that they're thinking of changing the town’s name to ‘Gradually’. This light moment of comedy is immediately followed by the film’s opening credits, which are punctuated by the dramatic score of David Raskin, giving us the sneaky suspicion that old times are about to return to Suddenly, and in a big, big way. 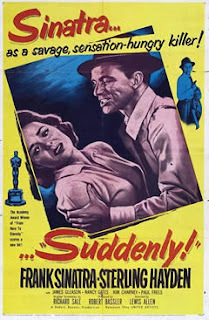 Tod Shaw (Sterling Hayden), the sheriff of Suddenly, has just received word that U.S. President Dwight D. Eisenhower is traveling by train to the west coast, and plans to make a brief stopover in his town at 5 o’clock that very afternoon. All at once, the Secret Service descends on Suddenly, teaming up with Shaw and his deputies to check on reports of a possible attempt on the President’s life. What they don't know is that the danger is already in town. A team of three hit men, led by army veteran John Baron (Frank Sinatra), has taken up position in a small house overlooking the train depot, holding the family that lives there hostage until the assassination has been carried out. The film's title, Suddenly, refers to more than the name of this town; it’s also a foretelling of how events will unfold in this fast-paced thriller. With a brisk running time of 75 minutes, Suddenly is quick and to the point, with electrifying twists and turns scattered throughout, anchored at all times by the strong performances of Hayden and Sinatra. Sinatra is especially effective, playing a former army assassin with a deep-seated resentment of all things military. In a gripping scene, Sheriff Shaw, accompanied by Secret Serviceman Dan Carney (Willis Bouchey), pays a visit to the house in which, unbeknownst to them, Baron and his men are hiding out. Soon after their arrival, gunfire erupts, and when the smoke clears, Carney is dead and a wounded Shaw is Baron’s prisoner. From this point on, the tension continues to mount as Shaw starts working on Baron, who he can see is slightly unhinged. It isn't long before the sheriff discovers the would-be assassin’s primary weakness: his talkative nature. He listens as Baron brags of having killed 27 Germans in World War II, a feat that earned him the Silver Star, and how his return to civilian life has left him confused and unsatisfied. Shaw plays on these feelings, pushing Baron closer and closer to the edge, all the while realizing that his fragile psyche could crack at any moment. The give and take between the two men, which grows more and more intense as five o’clock approaches, proves almost as nerve-racking as the story itself. Suddenly opens amidst the lethargic events of a quiet afternoon, and concludes with a violence that swoops down quickly, like a hawk striking at its prey. An account of small-town life thrown into chaos by politics and murder, Suddenly is exhilarating to the point of exhaustion. I picked this one up for $5.00 a few years back in a DVD 2-Pack with Sinatra's "Man With The Golden Arm". I thought it was pretty good, and was impressed with the fact that it didn't just seem to be a Sinatra Vehicle. That is, this was Sinatra acting...it wasn't Sinatra playing Sinatra, just using a different name. These days, it's all too common for musical stars to appear in films as characters which are just thinly-disguised versions of themselves. Nice write up. I had forgotten about that "Gradually" bit. That's classic. @J/Metro: Wow! I know SUDDENLY is public domain, so it's not gonna be expensive, but to get it with THE MAN WITH THE GOLDEN ARM as well is pretty cool. Both are really good films. When Sinatra did immerse himself in a character, he could be outstanding. It's a shame he didn't "try" all the time (but then, neither did Brando, one of my all-time favorite actors, and at least with Frank he could sing too!). Thanks for the kind words, and for the excellent comment. I do appreciate it.